Wearing aviator sunglasses and a tattered baseball cap and cradling an old arch-top guitar, Carl Thompson holds court in the back room of his shop in Brooklyn, New York. A small group of young apprentices listens intently as Thompson breaks down an old jazz standard to its elements, revealing elegant simplicity in its harmony. This eye for the essentials is at the core of Carl’s approach to doing just about everything not the least of which is building instruments. I don’t know anything about the molecular synergy of atomic structure he laughs. My concept is simple: First, I think about all the things I don’t want in an instrument. Then, once I get those out of the way, I end up with the things I do want. A jazz guitarist by trade, Thompson moved from the small Pittsburg suburb of Pitcairn to New York in the late 60’s; there, he worked at the repair shop of famed luthier Dan Armstrong. I worked at Danny’s to support my playing career, he says, but it was the opportunity of a lifetime. All the great guitarists came through Clapton, Bloomfield, Townshend, Kenny Burrel, Jim Hall. Of course, a number of great bassists came in as well. Carl first became intimate with the idiosyncrasies of the electric bass on one of his many jazz gigs. I was playing guitar six nights a week at a club in Brooklyn, he recalls. One night we had to back up a singer, and I was asked to play bass so I borrowed one from [veteran bassist] Bobby Cranshaw. Let me tell you, spending the night with one of those things was an education! The strings wouldn’t stay in tune, and the thing was really top-heavy. The next day, I decided to try building a bass you would keep balanced without using your hands. I figured that if you’re exerting energy just holding your bass, you’re working too hard. Committed to building a better instrument, Thompson opened his own shop and set to work. I went to the library and picked up a book on [legendary violinmaker] Antonio Stradavari. It talked about headstock angles, quartersawn wood, flatsawn wood Stradavari never made an electric bass, but he sure knew how to build an instrument. I, of course, learned how to build basses by making mistakes. That’s how my partner Ronnie Blake and I came up with our heel block by making a mess out of the hole and carving a new block of wood to make a clean neck joint. To this day, the heel block is my signature, my personal stamp. 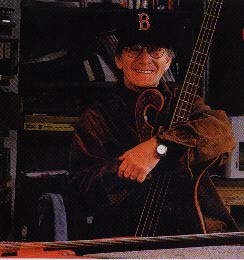 By the mid 70’s Thompson’s reputation as a builder who would try almost anything had spread among New York’s bass elite. He built the world’s first piccolo bass (a bass tuned one octave higher) for Stanley Clarke, and Anthony Jackson came to him with a request for an instrument that would not only change the face of bass building, but would play a large role in altering the course of contemporary music. Anthony approached me about building a 6-string bass, and my first reaction was crazy guy! Six strings, low B what are you talkin about? Anthony said he wanted to extend his range, but I told him the first thing we’d have to do is lengthen the scale 34 just wouldn’t be enough. To get that B sound right, we’d have to stretch it; it’s simple physics. He agreed, but he was so used to playing his Fender he wasn’t sure if he could deal with the longer scale – so we ended up making it 34. It was a difficult but worthwhile experience. Even with the recent upsurge in popularity and production, Thompson refuses to change his approach but he’s always looking for ways to improve his instruments. These days, I’m making basses that weigh only 6 ½ to 8 pounds, yet they stay completely balanced. He says many people think that a bass has to weigh a lot. It’s funny Les Claypool still can’t believe how little his 6-string weighs. I’m always searching for new things, so when people ask how long it takes me to finish a bass, I reply, I don’t know I’ve never finished one!